The most significant change to the script is the addition of batch mode. Many users have requested this feature and it makes framing a group of images very easy. You can select a folder of images that you want the script to frame and, after choosing the settings in the tabbed panels, run the script to process the folder’s images. One image must be open in Photoshop in order to choose or confirm the settings. First, open one of the images from the target folder in Adobe Photoshop. While you can open any image, it’s best to open one of the target images to ensure the settings (especially the EXIF and Metadata panel settings) are OK. Next, call the script from the Adobe Photoshop File/Scripts menu or by browsing (File/Scripts/Browse…) to the script’s location. Uncheck the FrameShop Use open images checkbox. Click the Select folder… button. Select a folder using the file browser window that pops up for your Windows or Mac OS system. Once you’ve loaded or confirmed your settings, running the script will process each file in the folder according to your settings. You can save or load previously used settings, so that your settings for different framing styles can be easily saved and retrieved. Clicking on the Save settings… button brings up a Save As dialog that lets you save the settings as a file in the desired location. Clicking on the Load settings… button brings up a file browser dialog that lets you load settings from a previously saved settings file. Tip: Save your settings files in a folder (for example, FrameShop Settings) somewhere easy to remember, like on your Desktop. There is no limit to the number of settings files that can be saved. The script will size the final framed image to fit within the maximum width and height dimensions specified by the user, just as the Adobe Photoshop File/Automate/Fit Image… menu function does. The image will not be distorted to fit the dimensions, but will be proportionally sized, then matted and framed to fit the maximum dimensions specified. 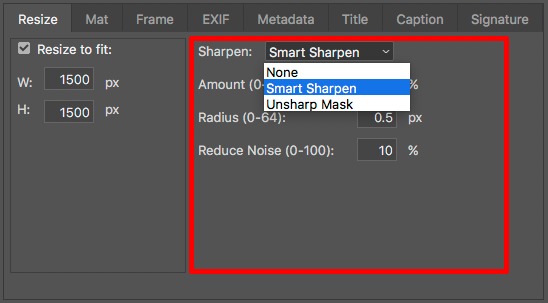 Two sharpening methods are available – Smart Sharpen and Unsharp Mask. In earlier versions, only a checkbox was provided for selecting Smart Sharpen which limited the utility of that feature. 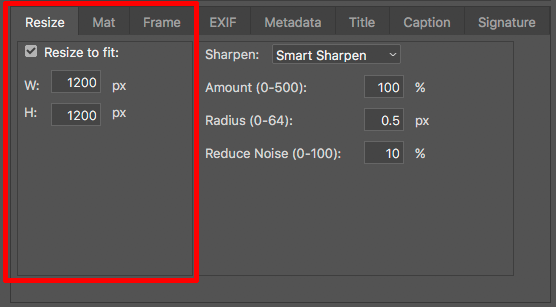 In this version, Amount, Radius and Reduce Noise options can be set for Smart Sharpen and Amount, Radius and Threshold options can be set for Unsharp Mask. Or you can choose “None” to bypass the sharpening step altogether. Sharpening is applied to the image after it has been resized but before the mat and frame are added. 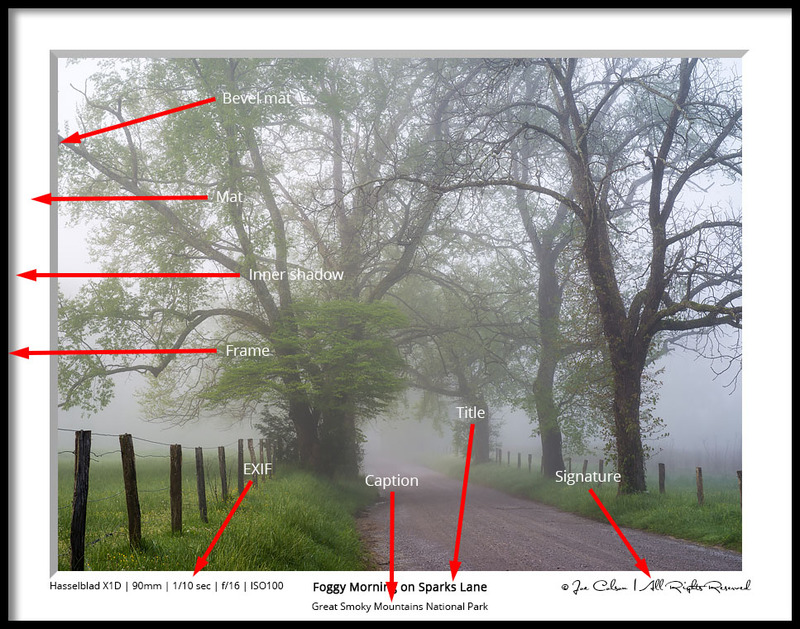 The EXIF text is by default positioned on the left in the bottom of the mat, but can be positioned either left, center or right. Its horizontal and vertical position can also be adjusted using the H offset and V offset boxes. The Font dropdown menu displays all of the fonts installed on the host system. The date can be displayed in one of four popular formats as shown below. Additional shooting information can be added to the EXIF text. This optional text can be used to document gear used (“Gitzo tripod”), shooting conditions (“Raining cats and dogs”), or any other information pertinent to the image (“Hand-held”). 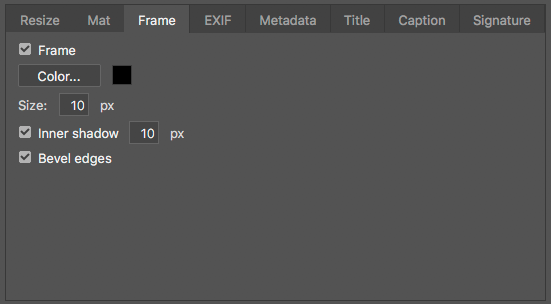 FrameShop determines from the file’s EXIF metadata what information is available, and shows that metadata next to the individual checkboxes on the Metadata tab. 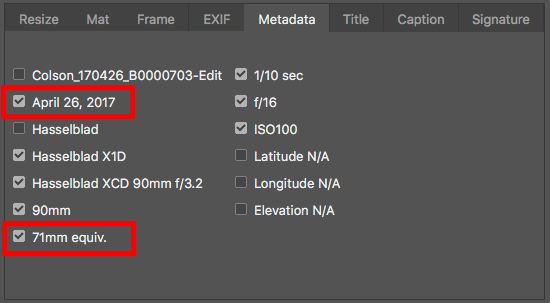 The Date taken displayed on the Metadata tab will be formatted according to the setting on the EXIF tab. In this case, Month DD, YYYY was chosen. The EXIF item Focal length in 35mm has been added and is especially useful for photographers who use camera formats other than full-frame 35mm (for example, APS-C, Micro 4/3rds, medium format). 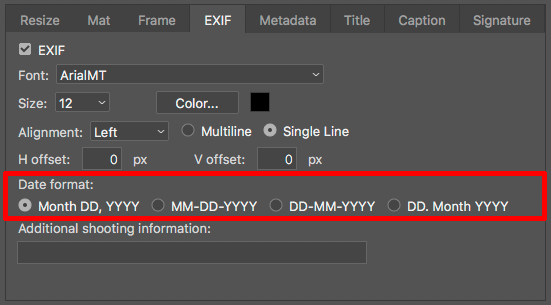 Tip: If you are uncertain about what information is available to Adobe Photoshop in the EXIF metadata, you can view the information from the Adobe Photoshop File/File Info… menu selection. 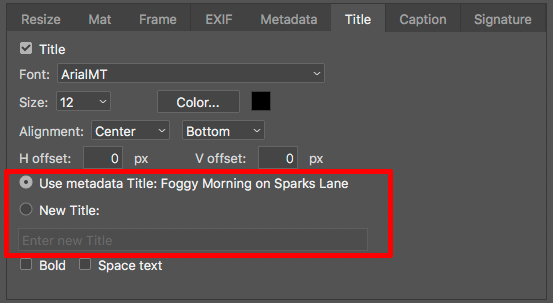 If title information has been saved in the source image’s IPTC Title metadata field (using Lightroom, Bridge, Photoshop or another image processor), the script will show that text in the Title tab following Use metadata Title. If no metadata title is present, the panel shows the message No metadata Title available. If the New Title button is selected, any text entered in the text box (below New Title) will appear in the framed image in the location chosen by Alignment, H offset and V offset. The Title text is by default positioned in the center in the bottom of the mat, but can be positioned either left, center or right. Its horizontal and vertical position can be adjusted using the H offset and V offset boxes. 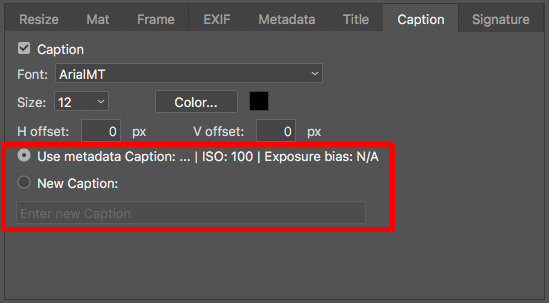 If caption information has been saved in the source image’s IPTC Caption metadata field (using Lightroom, Bridge, Photoshop or another image processor), the script will show that text in the Caption tab following Use metadata Caption. If no metadata caption is present, the panel shows the message No metadata Caption available. If the New Caption button is selected, any text entered in the text box (below New Caption) will appear in the framed image in the location chosen by Alignment, H offset and V offset. The Caption text is by default positioned directly beneath the Title. Its horizontal and vertical position can be adjusted using the H offset and V offset boxes. The Caption tab is enabled only when the Title tab is enabled. If copyright notice information has been saved in the source image’s IPTC Copyright Notice metadata field (using Lightroom, Bridge, Photoshop or another image processor), the script will show that text in the Signature tab following Use metadata Signature. If no metadata copyright notice is present, the panel shows the message No metadata Signature available. 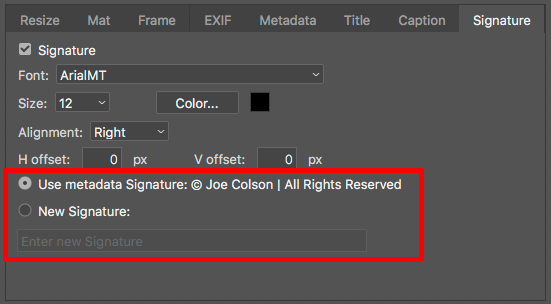 If the New Signature button is selected, any text entered in the text box (below New Signature) will appear in the framed image in the location chosen by Alignment, H offset and V offset. The Signature text is by default positioned on the right in the bottom of the mat, but can be positioned either left, center or right. Its horizontal and vertical positions can be adjusted using the H offset and V offset boxes. The Save panel options have been simplified to be more consistent with the Adobe Photoshop Save as options for each file type. 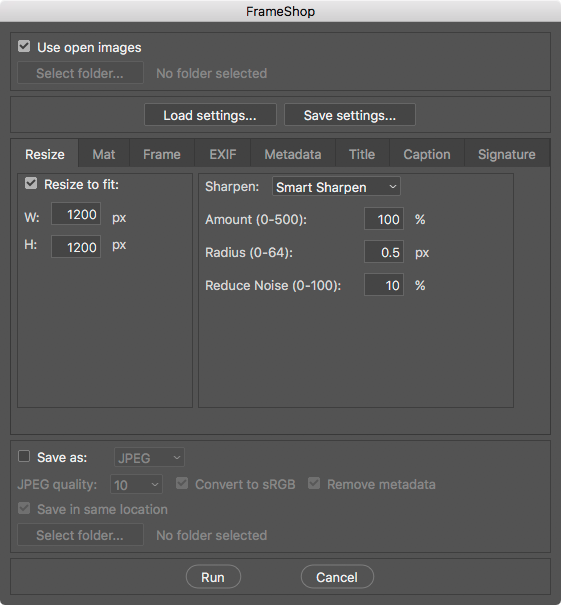 Once the other options are set, you can either run the script (by clicking Run), which saves the processed image as a JPEG, TIFF, PSD, or PNG, or run the script and have the framed image remain open in Adobe Photoshop. The image can be saved in the same location as the source file (Save in same location), or in a different folder by first unchecking the Save in same location box and then clicking the Select folder… button. 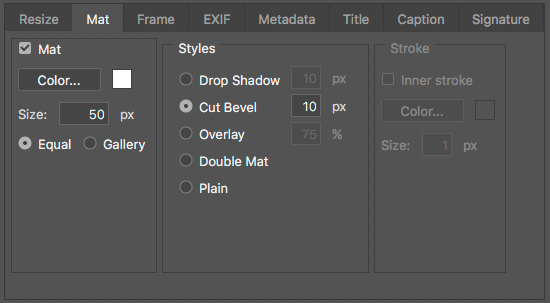 Tip: Running the script without checking the Save as box is useful when determining how to set the options, particularly the text offsets, or when you desire to manually adjust the layers in Photoshop. 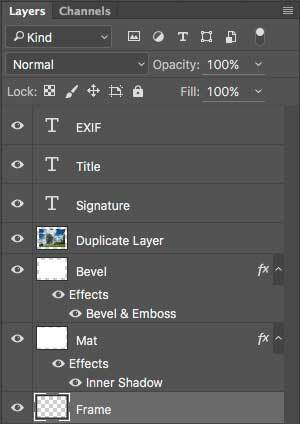 For example, with the Layers panel open in Photoshop, you can edit the text layers (EXIF, Title, Caption, Signature), set colors for the Mat and Frame layers, and/or adjust the layer effects. Download the .zip file and, after unzipping, copy or move the script (named FrameShopv1.0.0.jsx) to the Adobe Photoshop Scripts folder (Adobe Photoshop CC 201x/Presets/Scripts or Adobe Photoshop CS6/Presets/Scripts). The name of the script will be displayed in the Adobe Photoshop File/Scripts menu the next time Adobe Photoshop is started. Scripts added to the Scripts folder while Adobe Photoshop is running will not appear in the Scripts menu until the next time you launch the application. 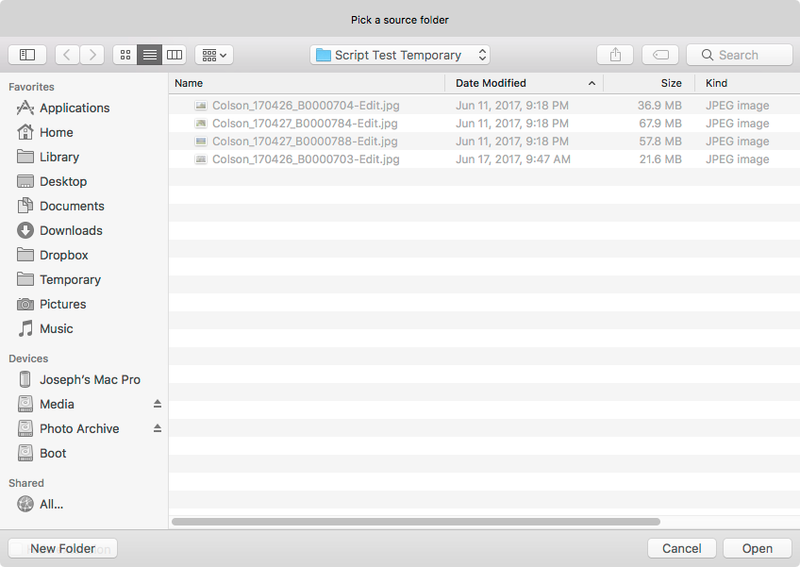 You can also run the script by using the Adobe Photoshop File/Scripts/Browse… menu selection. Using the file browser that appears for your operating system, browse to the location of the script and select it. The script requires Adobe Photoshop CC or CS6, and will run on a PC (Windows 7 or 10) or Mac (OS X). This version (v1.0.0) will not run on Adobe Photoshop CS5, earlier versions of Adobe Photoshop or on Adobe Photoshop Elements. It may not run on localized versions of Adobe Photoshop. This entry was posted in Uncategorized and tagged Adobe, EXIF, Frames, FrameShop, Photoshop, Scripts.